There are several different flowers and traditions associated with the Easter holiday. Here are just a few of them. The Easter lily is, of course, the traditional flower of Easter. 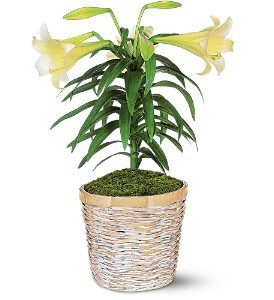 Easter lilies are generally white and represent goodness and purity. For Christians, the Easter lily represents the purity and perfection of Jesus. Another flower that is often given or used during Easter is the passion flower. It generally lasts for about three days, which correspond to the three days that Jesus spent in his tomb. The three stamens of the passion flower also represent the three crosses on the hill or the three nail wounds of Christ. Other flowers that are used during Easter time for decoration are azaleas, tulips, and daisies. One of the most traditional events of Easter is, of course, the Easter egg hunt. According to traditions, the first egg hunts may have been held back in 3000 B.C. by the Persians or the Egyptians. They also colored and decorated eggs as a way of celebrating the first of spring. The Easter bunny originated with the pagan festival of Eastre, a goddess. Her symbol was a rabbit. Easter baskets are used to collect eggs during egg hunts, but traditionally, Easter baskets represented the area where the Easter bunny laid its eggs. Two other animals are generally associated with Easter: the lamb and the chick. The lamb is another symbol of Jesus, while the chick breaking out of its shell is a representation of his resurrection.